In northwestern Quebec, two or three successive cohorts of trembling aspen may be recruited during succession on boreal mixedwood sites before the species disappears from the canopy (Paré and Bergeron, 1995). To some extent, this contradicts classical shade tolerance theory as canopy positions are held by both shade species and intolerant aspen at the same time. Thus, between large scale disturbances such as fire, small scale disturbances (gap dynamics) appear to allow recruitment of trembling aspen into the canopy. The spatial and temporal aspects of natural disturbances shaping the boreal mixedwood forest vary considerably, from very small gaps to very large fires. Boreal tree species respond differently to different types and sizes of disturbance. Currently man made disturbances in the boreal forest are quite uniform [low variation], favoring reproduction of only a narrow niche of species. In most cases, without post-harvest intervention, simple clearcutting (without protection of advanced regeneration) will short circuit succession and perpetuate aspen on the site, similar to the effect of fire (fig 1; Bergeron and Harvey, 1997). 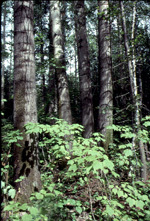 However, when spruce and fir are established in the understory, incorporating a greater range of disturbance classes in management techniques may provide a means of approaching the natural succession pattern from deciduous dominated to coniferous dominated mixed stands. Partial cutting systems, which, to some extent, resemble the gradual break-up of aspen stands in the absence of fire, are one technique currently being tried in the Forest. Aspen regeneration is being compared in cuts where 100%, 65% and 35% of the overstory basal area has been removed to establish a gradient of light in the understory. We hope to establish a link between light level increases due to cutting and height growth and density of aspen regeneration. Another objective is to identify minimal light requirements for successful aspen recruitment (which must be lower than conventionally thought). This artificial manipulation is paired with other experiments in the Conservation Zone of the Lake Duparquet Forest to establish relationships between gap size and aspen recruitment. Sucker production is also being studied in the natural forest in stands of different ages and light gradients. Fig. 1. Models presenting a) natural dynamics; b) current silviculture; c) a proposed silvicultural strategy for mixedwood sites in the Lake Duparquet Research and Teaching Forest.